Playscii is an open source ASCII art, animation, and game creation program. It runs on Windows, Linux, and Mac OSX. Download the latest build from itch.io, or get the source from the project's Bitbucket page. Read the documentation for details on how to create artwork and games. The Playscii Tumblr blog features artwork people have created with Playscii. A screenshot of Playscii 0.3.4 in Art Mode. 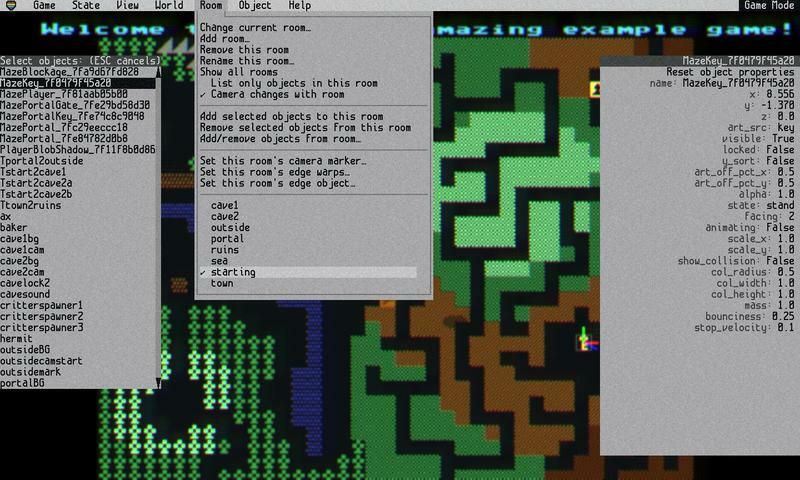 A screenshot of Playscii 0.8.0 in Game Mode. What is an ASCII and how does one Art with it? ASCII art uses computer characters (like letters, numbers, punctuation, or any other symbol that can be produced via text entry) instead of pixels to produce images. Old style emoticons like :-) are an early form of ASCII art, though it predates digital computers as typewriter art and continues today in a beautiful variety of forms. Sounds neat, can I try it out? 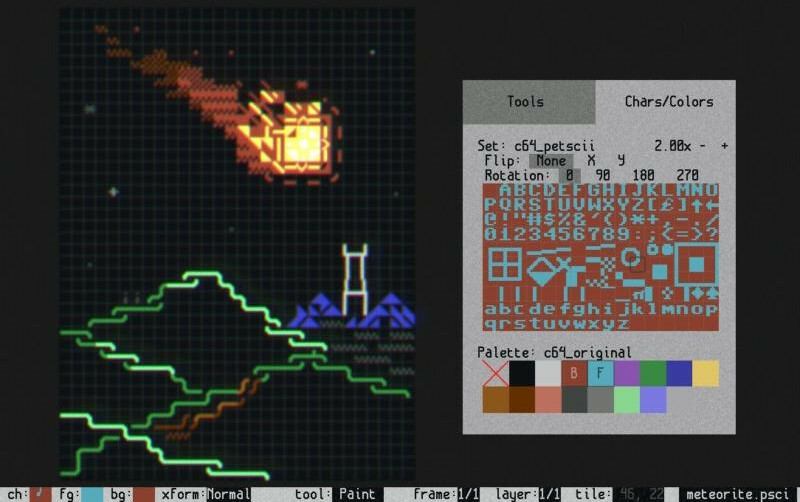 Playscii's development is ongoing and the program should now be usable for creating artwork and games. If you run into any bugs, please file a bug if you're able. Download the latest build here. New with 0.8.0, the project's documentation has detailed info on creating art and games, and is also included with Playscii itself. With the executable builds for Windows and Mac you don't need to have anything else installed - just download, unzip, and run. If you're running from source then you'll need the dependencies listed in the readme. What sorts of things have people made with it? Check out @Playscii on twitter or the Playscii Tumblr blog for art and development updates. You might also search for "playscii" on twitter to see work other people have made. Playscii's game creation capabilities are maturing as well: Endless Ladder Climbing 2 is the first released game made using Playscii, and PETSCII Fireplace is an example of a simple non-interactive "creative coding" style application. What's the development plan for Playscii? As Playscii's sole author I gradually expand on it for my own projects. If Playscii attracts interested developers who I feel I can work well with, I'd be happy to let the project's scope broaden as seems reasonable. If you add something neat to Playscii you think would work well as a core part of it, feel free to submit a pull request on the project's Bitbucket. Since version 0.7.0 most major features exist in some form, so development is now a process of refinement. For a very detailed view of what's being (or might be) worked on, see the project's Trello board. Voting and commenting are enabled for anyone with a Trello account, so feel free to do so if you see something that'd be particularly useful to you! Which open source license is Playscii's code offered under? The MIT license, which is very permissive so you can pretty much do whatever. Note that no license whatsoever applies to artwork you create with it, so please use it however you like!